Jose Mourinho has won the Champions League twice and Europa League twice. Not many managers can boast of such excellent achievements. But he is typical of the Champions League group stage in two respects. 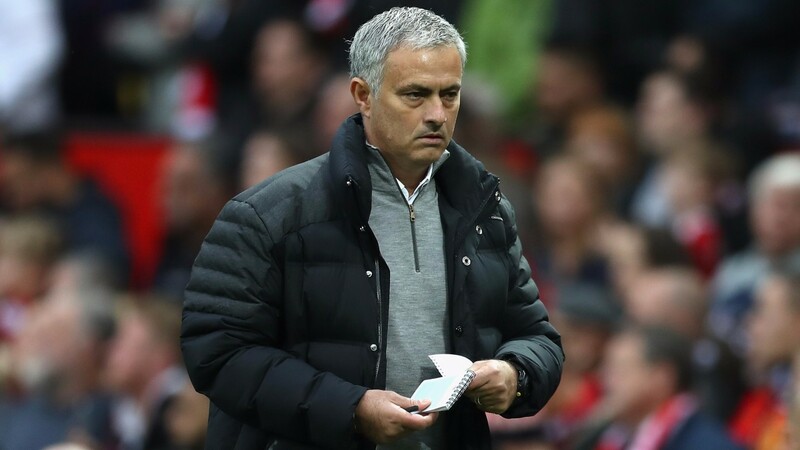 The first is by association with Manchester United, who have won 56 per cent of their group-stage games since the Champions League was restructured in 2003 – as near as makes no difference to the average for English entrants. Mourinho manages United in the Champions League for the first time. In those earlier years they reached the final three times but also failed to get out of their group three times. So there were ups and downs, but overall they were close to the norm for English teams. English teams won 55 per cent of their group games, drew 24 per cent and lost 21 per cent. They averaged 1.9 points per game. Eighty-four per cent finished first or second in their group and qualified for the round of 16, the other 16 per cent did not. 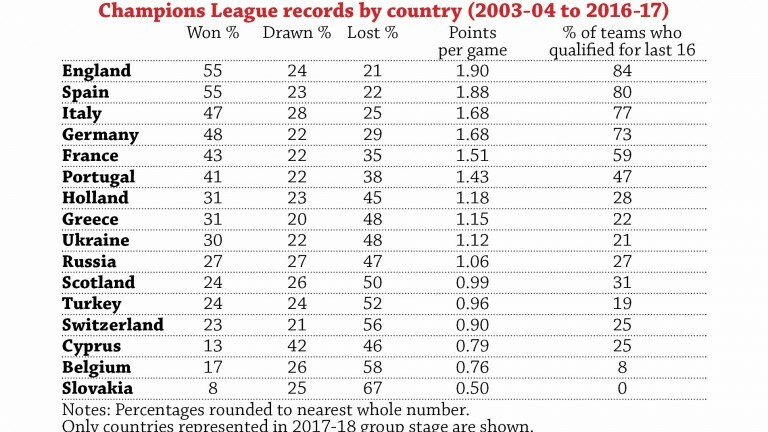 English teams still have the best group-stage record, as you can see in the table. It covers the 14 seasons since the Champions League was reorganised, 2003-04 to 2016-17. In the last few years English teams have not done so well and Spanish teams have done better. There have been clusters of success by countries in the Champions League. Six of the last eight finalists have been Spanish (and the other two were Italian). But no one can tell when one burst of success will end and another begin. Sir Alex Ferguson – Mourinho’s most illustrious predecessor as manager of United – said that in the Champions League: “Success is cyclical. At the moment, the cycle is with the Spanish teams. They’re the best, and that’s why they’re winning. But that will change.” He should know. I think that for most countries the table gives a reasonable idea of what we should expect in the groups this season. From a few countries there is a large difference in quality between entrants. Good year or bad, Real Madrid and Barcelona are usually a lot better than other leading Spanish teams, though recently Atletico Madrid have chased them hard. Across the last seven seasons, Real Madrid won 78 per cent of their Champions League group games, Barcelona 74 per cent and all other Spanish teams 45 per cent. Bayern Munich are usually a lot better than the next-best German teams. Over the last six seasons Bayern won 75 per cent of their Champions League group games, other German teams 45 per cent. PSG nowadays should be far superior to other French teams. They won 67 per cent of their Champions League group games in the last five seasons and should be even stronger now they have Neymar and Mbappe. Otherwise, I think, the table should give a reasonable guide to most teams from most countries. Each should do better against opponents from lower-ranked countries and worse against opponents from higher-ranked countries. Against any opponents they are more likely to win at home and more likely to lose away. Typically in the Champions League a team are about ten per cent more likely to win at home than they would have been playing the same opponents at a neutral venue and about ten per cent more likely to lose away. The second respect in which Mourinho is typical of the Champions League group stage is by association with his birthplace of Portugal. Portuguese teams are the closest to average group-stage opponents. They win and lose similar numbers of games, score and concede similar numbers of goals. They progress to the knockout rounds almost as often as they do not. When Mourinho managed Porto they won the Champions League in 2004. Then they were better than usual for Portuguese entrants. Even afterwards Porto and Benfica were generally ahead of Sporting. Perfectly average Champions League opponents would be better than Sporting but not quite as good as Porto or Benfica. And many countries would be delighted to achieve that sort of mediocrity. Fourteen of the 31 countries represented in the group stage since 2003 – nearly half – have not produced one team that qualified for the round of 16. Real Madrid became the first club to retain the Champions League when they won the 2016-17 final. They have now lifted the trophy three times in four seasons. Their triumph in June was the 12th time in 12 years that the Champions League had been won by a team with one of the six highest wage bills. It was also the 14th time in 17 years that the Champions League had been won by a team from the top six of the Deloitte Football Money League. Deloitte have not yet published the Money League that covers last season, but we can be confident Real Madrid will be at least in the top six. They were in the top three in each of the previous 13 seasons. Usually there is a lot of similarity between lists of high revenue earners and lists of high wage payers. Anticipating the top six payrolls for this season is complicated more than usual by the fact that English clubs pay in pounds while Spanish, French, German and Italian clubs pay in euros. Movement in the exchange rate could alter some places. Among the euro clubs the order should be Real Madrid, Barcelona, PSG, Bayern Munich then Juventus. Most likely Manchester United, Manchester City and Chelsea will come above Bayern with Liverpool below and Tottenham beneath Juventus. Those will be the top ten, but it is possible Bayern could move up into the top six. Azerbaijan is the 32nd country to be represented in the 32-team group stage since the Champions League evolved into its present format in 2003. On Tuesday Qarabag play at Chelsea, champions of England and former champions of Europe. Other countries represented this season are Belgium, Cyprus, France, Germany, Greece, Italy, Netherlands, Portugal, Russia, Scotland, Slovakia, Spain, Switzerland, Turkey and Ukraine. Countries represented in at least one of the previous seasons were Austria, Belarus, Bulgaria, Croatia, Czech Republic, Denmark, Hungary, Israel, Kazakhstan, Norway, Poland, Romania, Serbia, Slovenia and Sweden.